Sometimes, when visiting wineries, you say things that make you very popular. During a visit to the Boxler family I praised the beautiful and original label on the firms' crémant. It turned out to be a child's drawing, made by their son Louis at age six. It was their own idea to divide the drawing into separate fields, and add one which is metallic copper colored in the same tone as the foil cap on top of the cork. Neat! 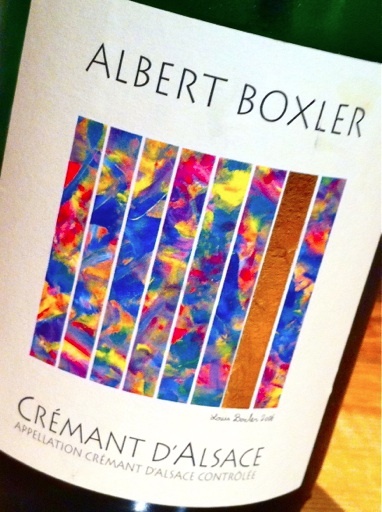 Crémant from Albert Boxler in Niedermorschwihr is from vintage 2008. The aroma is wonderfully fresh with apples, lime, minerals and a hint of sourdough bread. The flavor contains both soft, velvety fruit and crisp, focused acids that form a harmonious whole. The mousse is fine and lifts the wine to great heights. Good, usable and ridiculously cheap. Price: € 9.50.